We’ve heard it time and time again—eat your vegetables! Luckily for us this yummy lentil salad makes it easy. 1. Rinse the lentils and place them in a large saucepan and add plenty of water to cover; tie the bay leaf, celery and thyme into a bundle and add to the pan, then bring to the boil; reduce the heat so that the water boils steadily; cook the lentils for 30-40 minutes or until they are just tender. DO NOT ADD SALT at this stage, as it toughens the lentils. 2. Meanwhile, to make the dessing, mix the oil, mustard, 3 teaspoons vinegar, garlic and lemon rind, and season to taste with pepper and salt. 3. Thoroughly drain the lentils and transfer them to a bowl, add most of the dressing and toss until all the ingredients are well-combined, then set aside, stirring occasionally. 4. Heat the oil in a deep pan and cook the onions or shallots over a low heat for 4-5 minutes, until they are beginning to soften. Add the cumin and cook for 1 minute. 5. Add the spinach and season to taste, cover and cook for 2 minutes; stir, then cook again briefly until wilted. 6. 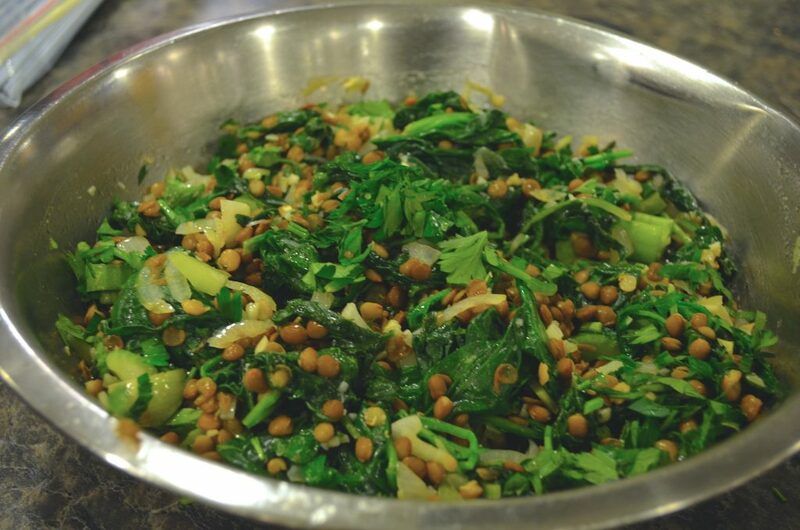 Stir the spinach into the lentils and leave the salad to cool. Bring back to room temperature if necessary. Stir in the remaining dressing and chopped parsley, adjust the seasoning, adding extra wine vinegar if necessary. 7. Transfer the salad to a serving platter and scatter over some parsley sprigs. *Chef’s Note: Puy lentils are named after a town in France. They are considered to have the best and most distinctive flavour and they keep both their shape and colour well when cooked, making them ideal for salads.